Here comes the third episode on street food in Southeast Asia. After noodles and dumplings it’s time to talk about BBQ. What’s better for an open air meal? 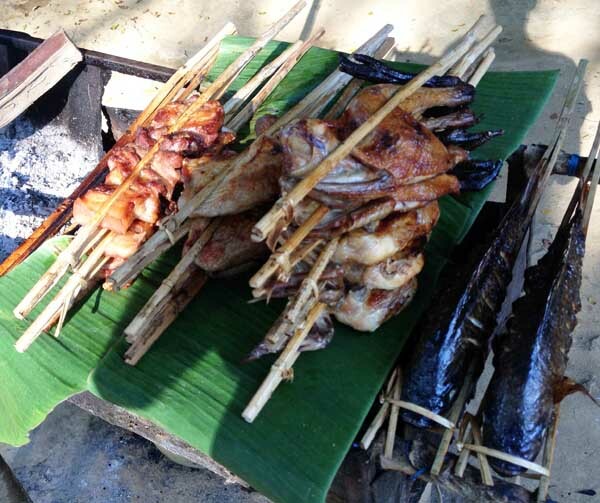 Probably one of the earliest forms of street food in human history was a kind of barbecue. Some wood, some charcoal and some stuff to eat in skewers. Simplicity always wins. You have a good example in Southeast Asia where a motivated guy can always build a small BBQ in half a meter space. At the same time, however, there’s a great tradition in the region. 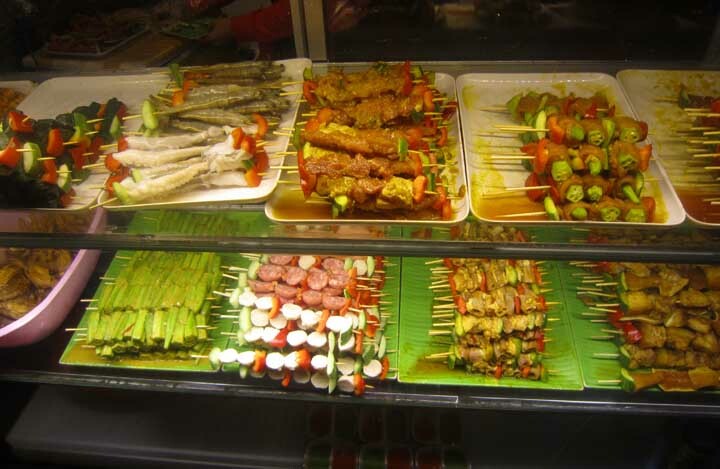 Appearently, Thailand, Malaysia and Indonesia contend each othere the invention of satay (or sate), the grilled skewers accompanied by sauces. The place of origin is supposed to be Java island, but I won’t do any comparison (I haven’t been to Indonesia yet). 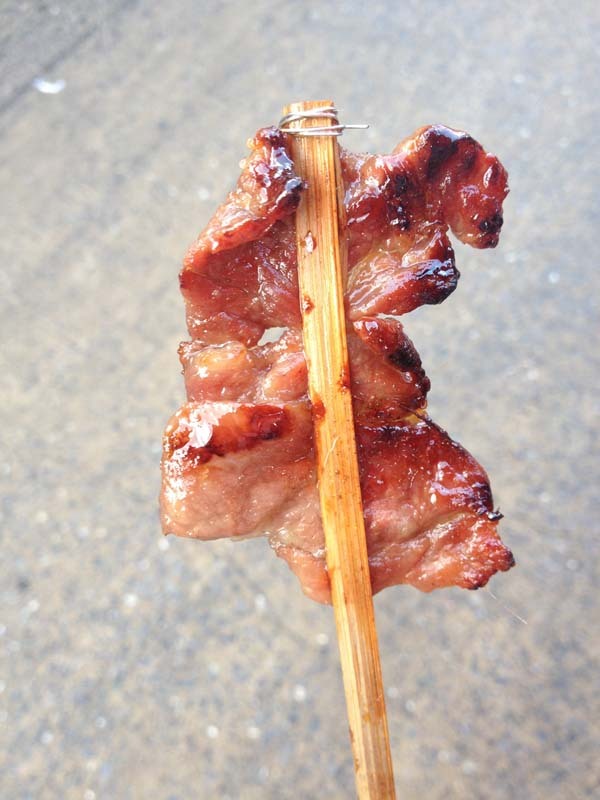 In any case, the meat is always strongly marinated, generally with a sweet and sour marinade that contributes to caramelisation on the barbecue. 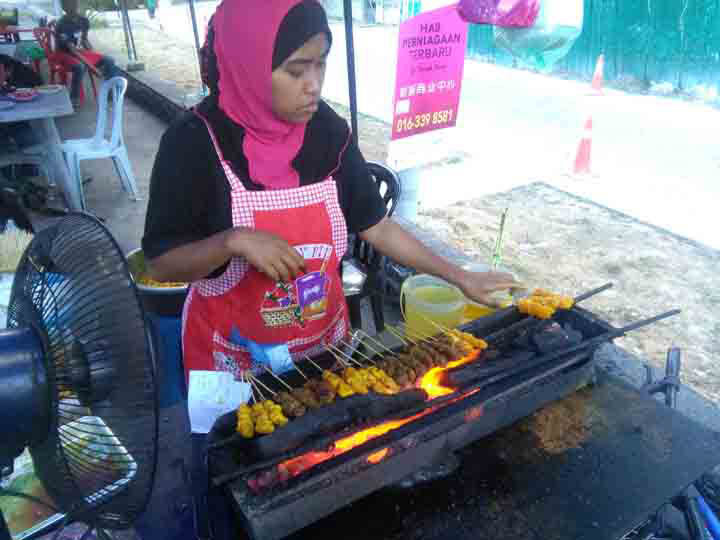 From what I have seen in Thailand, Laos, Vietnam, Myanmar and Malaysia, I guess that in Southeast Asia you have two types of street BBQ. – A rich selection of skewers or other food you choose before cooking and in some cases you put on the barbecue by yourself. 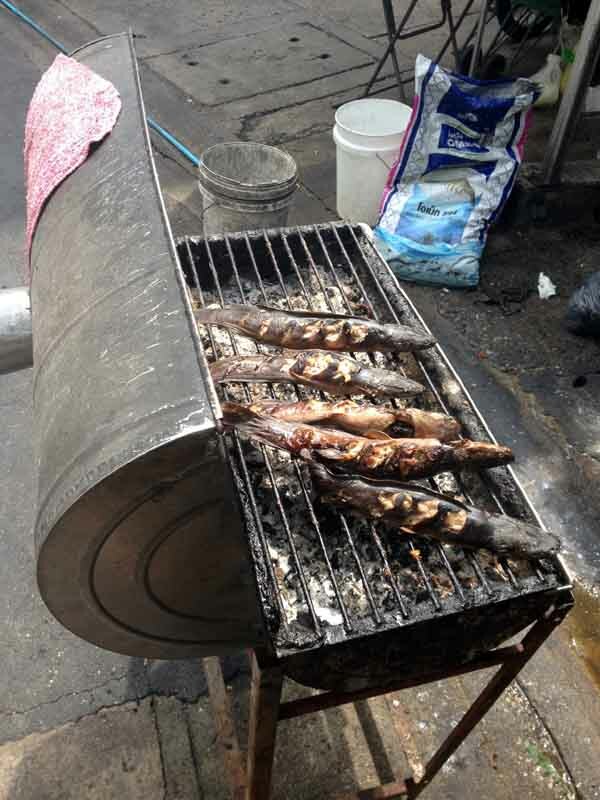 In Bangkok at almost every corner you can find someone with a small barbecue. Sometimes they are so tiny that can contain just 6-7 small skewers at a time. Meat is the king, of course. But there are also other things, as I tell further on. 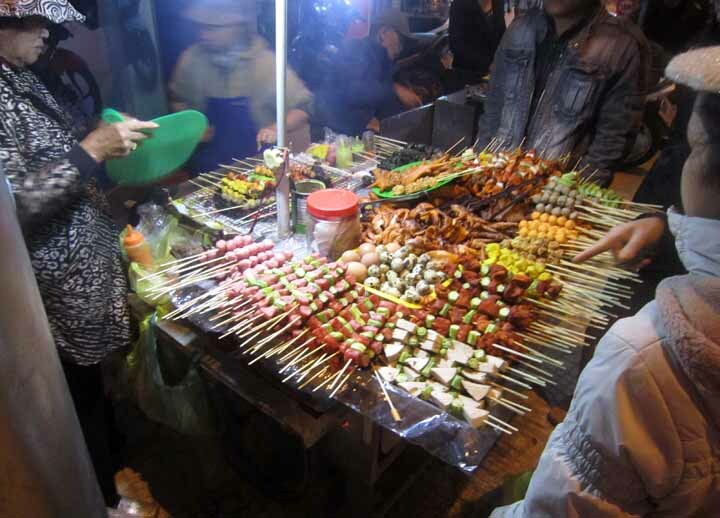 For sure the most common offer is made up of chicken and pork skewers. The latter were my favorites for a quick snack. Just a few grams with tasty caramel flavor. 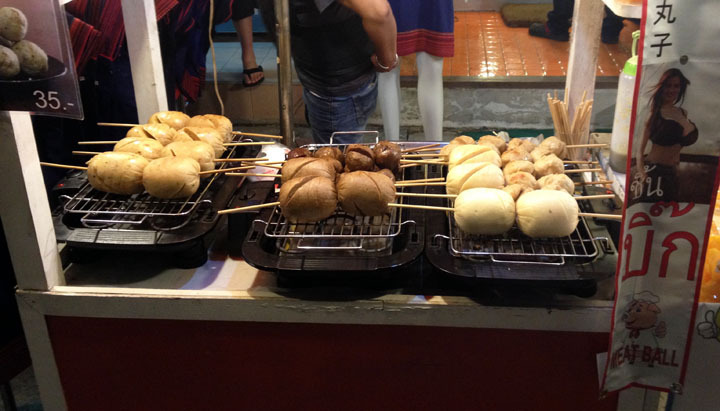 To be honest, I didn’t find Laos street food exciting. Very repetitive, often with ready stuff stationing for a long time and tasteless noodles. But a few things are worth to try. These include BBQ. Definitely a winning factor is size. 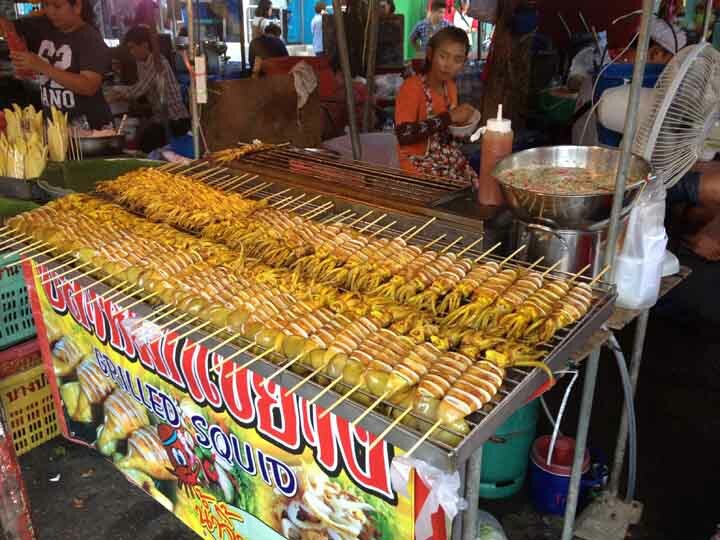 Chicken legs and things are huge and beat any skewer you can seen in Southeast Asia. And they are also very tasty. I didn’t have many opportunities to try BBQ in Malaysia, but a Saturday night in Cameron Highlands gave me the opportunity to mix with Malaysian (locals and weekenders) packed in a few street food stalls. The one I chose had a small barbecue, but the three ladies managing it were working hard. There were 4 choices of skewers. Chicken (marinated in a turmeric and other spices sauce), mutton, beef and beef tripe. No pork since it’s a Muslim country. I tried them all, of course. I preferred the beef and found interesting the tripes (very tender thanks to the marinade). A delicious experience. 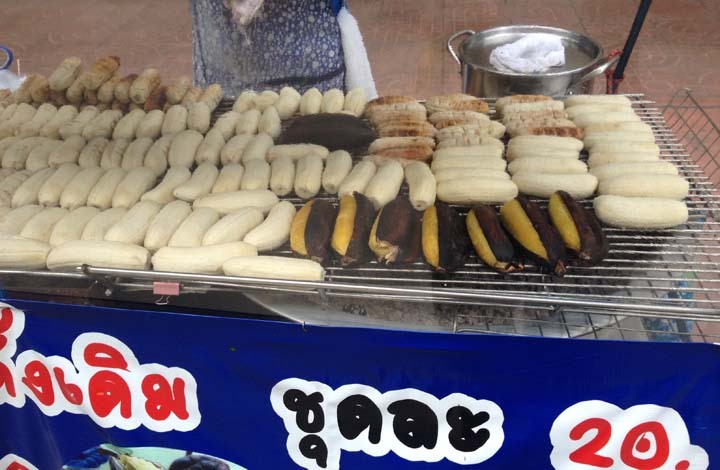 Sausages on Southeast Asia’s BBQs are less present than Europe’s or America’s ones. And generally they are less attractive. With a notable exception. 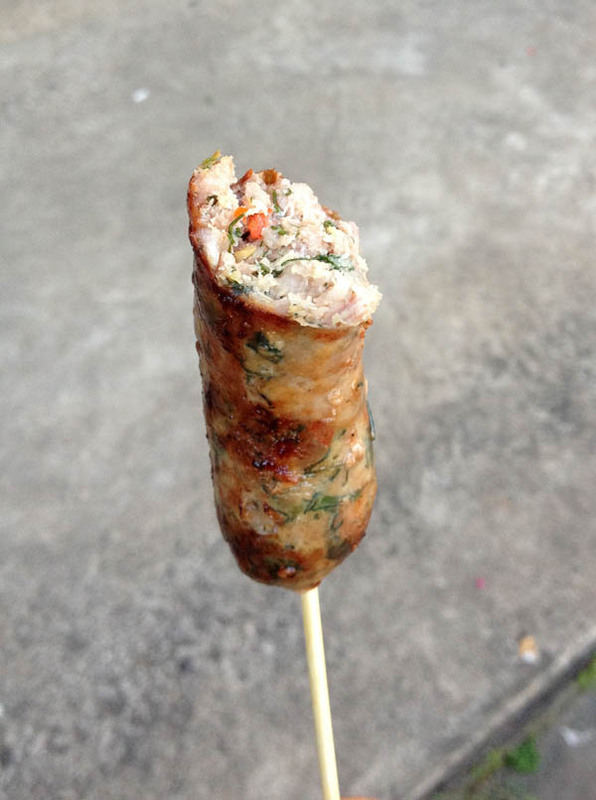 I love the Laotian sausage (in North Thailand they have a similar one called Sai ua) and I had it many times. It is richly flavored with traditional herbs and spices: lemongrass, galangal (a kind of ginger), kaffir lime leaves, chilies, shallots, coriander. An explosion of flavors within your mouth. Delicious. The night I arrived in Da Lat the flower festival was starting. The city was packed with eople and the center was invaded by street food stalls. 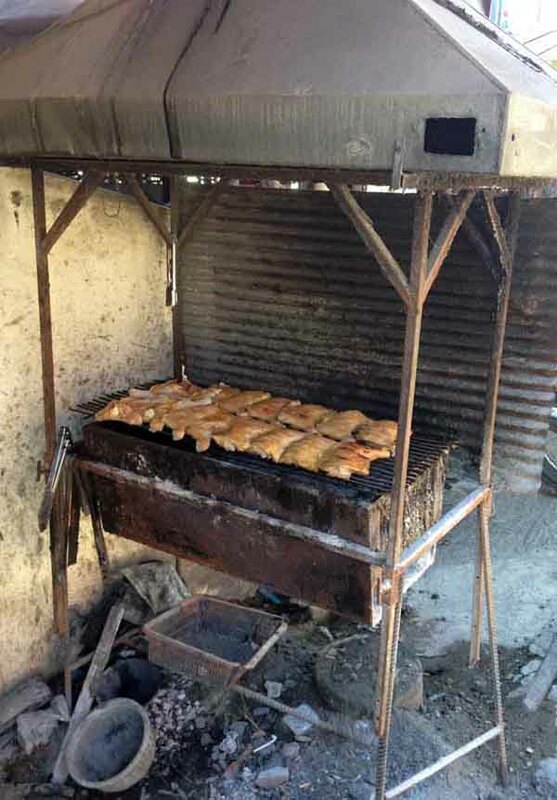 But it was in a side street that I found by cahnce the most exciting barbecue I’ve ever tried. The window on the road displayed many types of colorful skewers. After you place your order, the dish (still raw) was brought to the table (very tiny as usual on Vietnam streets) along with sauces, vegetables and … three bricks! Yeah, I mean building bricks. Away freom the road side a lady surrounded by smoke – a sort of firelady – was busy in preparing the coals. After a while I recieved a hot metal box topped with a grill. And so I started to cook my own skewers. Obviously, I made a second order and in the end I tried everything they had. Pork, chicken, beef – also wrapped in the betel leaf -, pork rind, shrimp, octopus, vegetables. The quality maybe didn’t deserved to rank #1, but the overall experience was awesome. Bonus: a Vietnamese guy come to me to get a selfie for his FB. I sometimes found grilled duck in Laos. In Luang Namtha I had a very good one, while in Luang Prabang I saw this nice cart barecue. Noticd they are cooked with their head on. 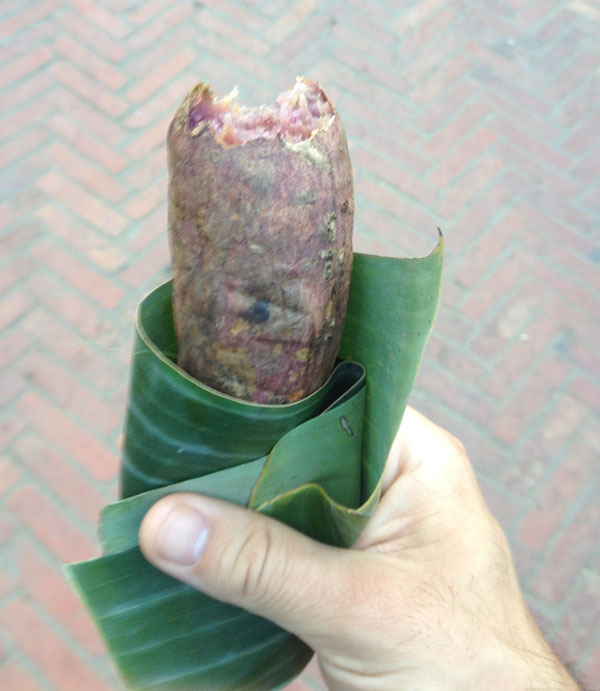 I tried it in Luang Prabang, but saw it as well in other places in Laos and Vietnam. Tasty. You find it everywhere in Southeast Asia. Usually medium-sized, they can be grilled peeled or unpeeled. Personally I prefer them fried. 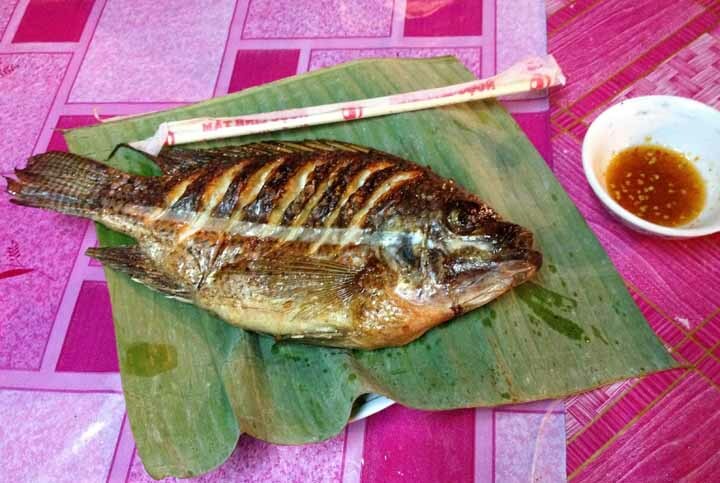 Tilapia is one of the Mekong’s most common fish, you can find it quite often on BBQs. Not bad but not very tasty. Catfish is used for cooking a wide variety of dishes, because there is plenty of them, it’s cheap and doesn’t have small bones. Not so common to see it grilled. Anyway, after seeing crowds of them in Bangkok’s shallow waters, I didn’t wanto to eat it anymore. In the Mekong they can weigh up to 300 kg. 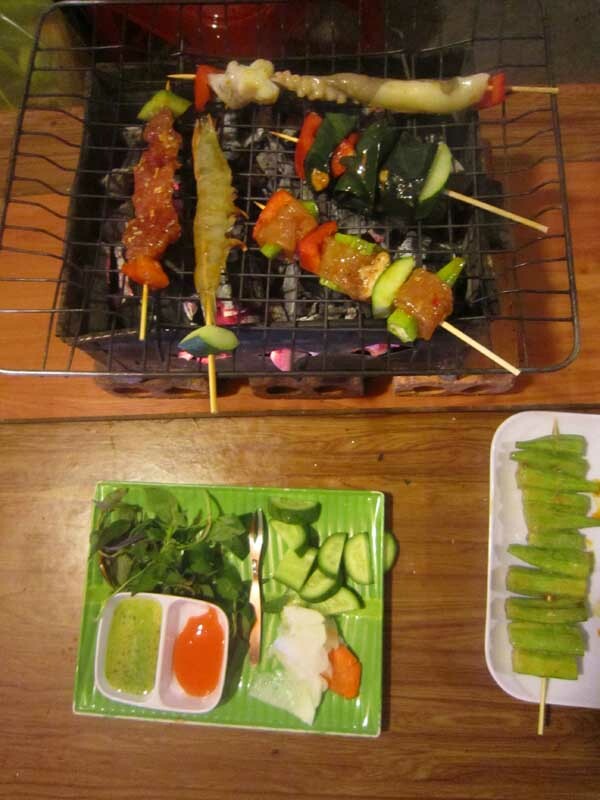 Squid is popular on Thai BBQ. They can be of medium or large size, but the ones I had were often chewy (overcooked). Do these sausages recall you something? The image on the right confirms it is intentional. No surpirse, I was in Pai, a town packed with Western and Aussie dudes, “in target” I’d say. Didn’t find them appetizing, so I did not try them. Anything to say about Asian BBQ? Leave a comment! 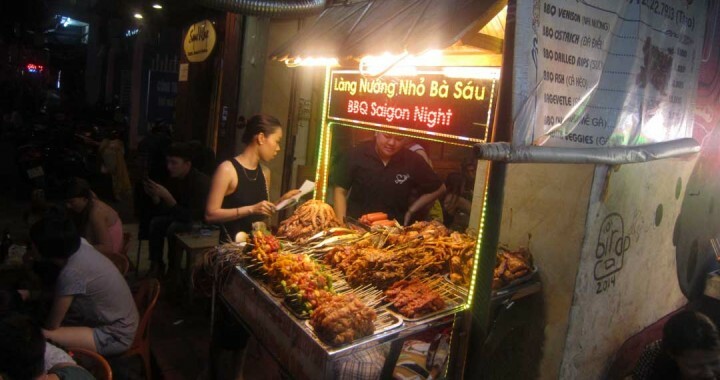 Posted in Travel and tagged agriculture, barbecue, BBQ, food, Southeast Asia, street food.